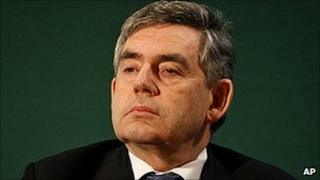 Gordon Brown has said he was prepared to quit as Chancellor soon after Labour took office in 1997 if the government decided to join the euro. He was "ready to resign" if he could not persuade colleagues, including Tony Blair, of the "grave risks" of signing up to the single currency at that time. The disclosure is included in Mr Brown's new account of the 2008 banking crisis which has just been published. In the book, he says an "alien" culture of excess took hold of the City. In Beyond the Crash, Mr Brown seeks to explain the decisions he took in bailing out leading UK banks in October 2008 and identify lessons from the crisis for future global financial governance. Weeks before the crisis struck, Mr Brown said he had decided the UK could not afford to wait for the international community to step in to stabilise the banking system. "The banking problems ran deep and were so systemic that Britain could not afford to wait for others to join us before taking root and branch action to save our banks," he writes. "By September I knew we were days away from a complete meltdown. I had set a course and was prepared to go it alone if necessary." But Mr Brown said he was under no illusion about what would have happened if the £50bn bailout of three leading banks - and the £450bn in further credit guarantee and liquidity - had failed. "I was about to announce that we were offering to invest billions and take control of Britain's two biggest banks - something no government in British history had ever done. If what I was about to do failed, I would have no choice but to resign." Mr Brown suggested he had been "misled" about the financial strength of Royal Bank of Scotland in the run-up to the crisis and its problems were part of a wider breakdown in trust in the City, where excessive bonuses and risk-taking had become rife. "The motto of the old order in the City of London was 'my word is my bond' but the financial crisis revealed a culture quite alien to that heritage. "The stewards of people's money were revealed to have been speculators with it." Mr Brown, who stood down as prime minister after Labour's election defeat in May, said Europe's current debt crisis risks creating an "existential" crisis for the single currency. While it was in the UK's interests to help support the eurozone, he said the current problems vindicated the UK's decision not to seek euro membership in the early years of the Labour government. Senior ministers, including then Prime Minister Tony Blair, were believed to be keen on joining after Labour came to power in 1997. Although he was "not blind" to the benefits of membership himself, Mr Brown said he was clear about the dangers for the UK economy - in terms of its impact on interest rates, inflation and investment in public services - of the euro when setting tests for entry. "When I first expressed my doubts about Britain's entry, I stood virtually alone in the Cabinet. "Indeed, I was ready to resign as Chancellor if I was unable to persuade my colleagues of the grave risks of taking us immediately into euro membership. "But having considered all the arguments, we concluded unanimously that although the euro was right in principle, it could not work for Britain at that time." Mr Brown has kept a low profile since leaving office in May, speaking once in the House of Commons. His book's publication follows the release of Tony Blair and Peter Mandelson's accounts of Labour's time in government this summer.